There’s a long-standing perception that boys don’t care about fashion. Any mother with teen boys will tell you that’s a myth. While boys may not scan fashion magazines with the intensity that girls do, boys can be just as fashion-conscious as girls. The biggest differences between boys fashion and girls fashion is that boys also demand comfort in their fashionable clothing. That’s why the perennial staple in a boy’s wardrobe is the boys t-shirt. 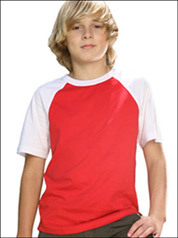 With today’s new styles, your son can easily live in t-shirts and still be on top of the fashion world. If you’re blessed with a son who loves to look trendy, these top boys t-shirt styles will make him a happy camper this summer. If your boy loves his hoodie, but has to put it away for the summer, indulge his fashion sense with a long sleeve t-shirt hoodie. The lightweight cotton fabric is cooler to wear in the summer, and the hood says “style” in a loud voice. On a practical note, long sleeve T-shirt hoodies are the ideal beach cover-up for boys who burn easily, thanks to long sleeves and to a lightweight hood that will protect his scalp from burning. 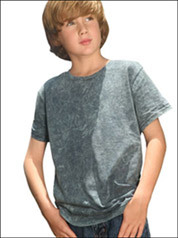 New dye techniques have opened up a world of possibilities for boys t-shirt variations. Silicon and acid washes create a funky crinkled dye look that boys love. Choose from perennial favorite boy colors like black, charcoal gray and denim blue, or let him take a walk on the wild side with turquoise, pink or even purple. The 100% cotton guarantees a comfortable fit and the splashy dye pattern will make these t-shirts his favorites for everyday wear. And they’re back again this summer. The newest twist on the camouflage trend is a heathery dye treatment that gives the shirts a worn-in, comfortable look and feel. 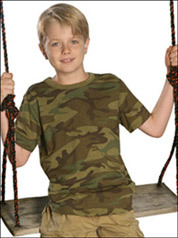 Basic army green camo is still the hottest look on the fashion front, but desert sand and concrete gray are high on the must-have boys shirt list, and blue and pink camouflage prints are nearly as popular with boys as they are with girls. Contrast raglan sleeves and crew neck ribbing turn a basic boys t-shirt into a fashion classic—the baseball tee shirt. The sporty look is a favorite with athletic boys, in large part because the raglan sleeve styling is so comfortable. Pick up a few in his favorite sports team’s colors and watch the smile spread from ear to ear. Just because your number one son lives in t-shirts doesn’t mean he has no fashion sense. Choose from some of the top boys t-shirt styles to make him a happy camper this summer.